Over the years, the Jordan Brand has done a masterful job of creating numerous logos that are both instantly recognizable and always associated with the company. Of course there is the Jumpman and the Balls and Wings logo, but there are also other emblems the likes of its signature “Jordan” block text, and the interwoven Air Joran hit that takes shape on the heels of this new Air Jordan 1 Mid. 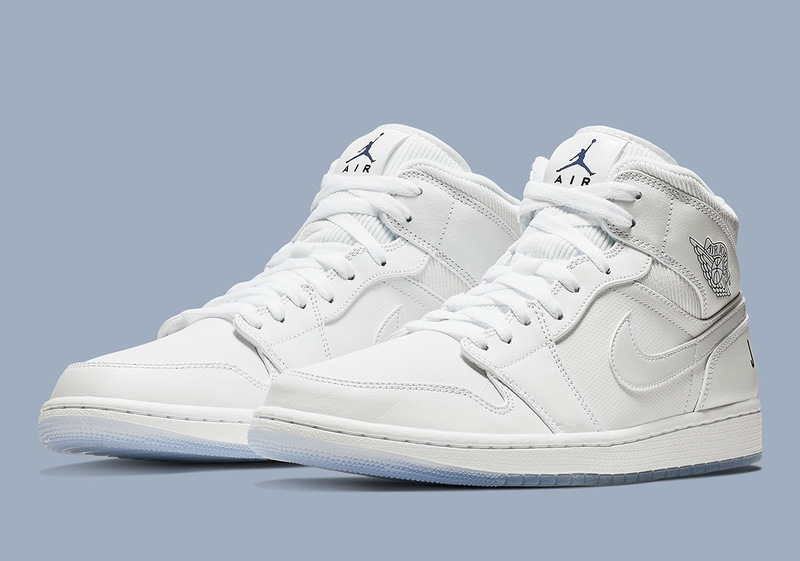 Dressed in a snowy combination of Pure White and icy blue, this AJ 1 creation ushers in ribbed textile panelling on its underlays for a premium effect, with both perforated and tumbled leather sharing responsibility elsewhere. Three of the four aforementioned Jordan Brand motifs find homes in different areas across this offering in a contrasting blue shade to break up its otherwise tonal white aesthetic. Grab an official look at this winter-friendly Jordan 1 below and check out a few where to buy links to help you grab a pair right now.